Fright Fest 2013 is in full swing down at Six Flags Great Adventure, with over 200 zombies being released every weekend from now through Halloween! The "brains" (pun intended) that run this massive operation have a big task at converting the world's largest theme park into a spooky nightmare, and the park has shared 13 Fun Facts about the event with Theme Park Overload! Check them out! 1. It’s all about the zombies. 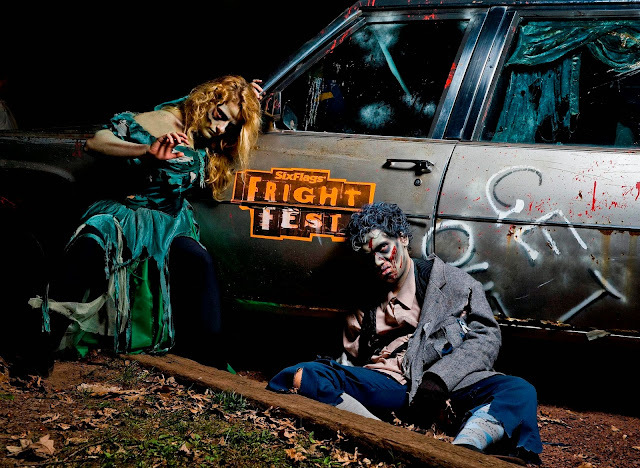 200 zombies terrorize the park after 6 p.m., and can be found angrily wandering the midways or stalking guests in terror trails and haunted houses. 2. There are seven master makeup artists who use 1,500 ounces of airbrush makeup and fake blood to transform 200 actors, students, parents and business professionals into flesh-hungry zombies each night. 3. Things that go bump in the night: Fright Fest zombies use shovels, chainsaws, clown horns and metal cans filled with marbles to amp up the startle factor on the midways. 4. Special effects supervisor Tony Mandile creates 600 latex foam facial prosthetics from scratch, and each is used only once. At the end of the night, they are discarded and new ones are created every week. 5. Team members travel from as far as Maryland and Connecticut each weekend to perform as a Fright Fest zombie. 6. Not to be corny, but Fright Fest requires 1,500 bunches of corn stalks to complete the corn mazes and festive park décor. 7. The Bloody Fountain is colored by eight pounds of food-grade, red vegetable dye. 9. Spiders galore! It takes 1,200 pounds of beef tube webbing to transform the theme park into a scream park. 11. 35,200 lbs. of propane are required to illuminate the spooky flame columns in the heart of the park. 12. While summer is known for theme parks and thrills, Fright Fest is actually the most popular time of the year at Six Flags Great Adventure. 13. In addition to zombies, thrill rides are a main attraction during Fright Fest. Guests can’t resist a spin on their favorite world-class coaster in the dark like El Toro, Nitro and Kingda Ka. If you experience Fright Fest at Six Flags Great Adventure, be sure to let us know how your experience was on our Facebook page! www.Facebook.com/ThemeParkOverload My name's Nicholous, and Thanks for Reading!